"It is a physical impossibility for a non perfect being to create something perfect. But, if you strive for perfection, the result will mimic perfection so closely that only the creator will know the difference!" Every Tone Wheel Hammond that endures the Classic Hammonds® rebirth process is spared no time or resources to produce only the few that deserve to display the Classic Hammonds® badge. The entire process averages 200+ total man hours to complete. If one does not know how a Hammond is supposed to look, feel and function, how can one re-create it? In order to create ?The ultimate in museum and collectable Hammond organs?, Classic Hammonds® has spent many years acquiring the knowledge necessary to properly evaluate the Hammond and determine the most veracious course of action for its phoenix. The overall physical condition of the Hammond is evaluated including finish condition, wood condition and structural integrity. The Start and Run switches are evaluated for proper operation and wear. The Start and Run motors are evaluated for proper operation and wear. Every key on each manual of every drawbar is evaluated individually for volume, tone quality, tone consistency, attack, decay and mechanical action. Every pedal note on the two drawbars is evaluated individually for volume, tone quality, tone consistency, attack, decay and mechanical action. The drawbars are evaluated for smoothness, consistency in volume increase or decrease, and continual sound while in motion. The Vibrato, Chorus and Percussion are evaluated to determine their current operational condition. The Presets are evaluated for functionality, proper tone selection, and mechanical operation. The Hammond manual chassis is evaluated to determine its operational condition. The Hammond tone generator is evaluated to determine its operational condition. The Hammond pre-amplifier experiences detailed diagnostics to determine its operational condition. process to ensure the ultimate in quality. The overall physical condition of the Leslie is evaluated including finish condition, wood condition and structural integrity. The Leslie treble driver and bass speaker are stringently evaluated for tone quality utilizing a tone generator. The Leslie upper motors, lower motors and belts are evaluated, including rise and fall times. The Leslie amplifier experiences detailed diagnostics to determine its current operational condition. Each Leslie is subjected to numerous quality control inspections throughout the rebirth and re-assembly process to ensure the ultimate in quality. Every Tone Wheel Hammond that is reborn by Classic Hammonds® is processed using CCORP™ (Complete Chassis Out Rebirth Process). CCORP™ assures you that Classic Hammonds® removes every mechanical and electronic component from the cabinet. The cabinet is totally empty at the completion of this stage. All parts are marked and stored in plastic bags, labeled with the part name and Hammond serial number. This process ensures that all parts are returned to the Hammond they were born with. The music rack assembly is removed. The pre-amplifier wiring is unsoldered and it is removed. The keyboard and pedal connections are unsoldered from the tone generator and it is removed. The keyboard/drawbar and pedal actuator assemblies are removed. The expression pedal assembly is removed. The brass hinges attaching the Fallboard assembly are removed. The remaining miscellaneous parts are removed. All bench hardware is removed. All major parts are affixed with a printed label that bears the serial number of the Hammond. The upper motors, belt, horns and treble driver are removed. The lower motors, belt, drum assembly and bass woofer are removed. All wiring harnesses and the cross-over and the amplifier are removed. All major parts including the back panels are affixed with a printed label that bears the serial number of the Leslie. Every Tone Wheel Hammond that is reborn by Classic Hammonds® utilizes HTP™ (Hammond Technology Plus). HTP™ assures you that Classic Hammonds® scrutinizes every component thoroughly. All components are rebuilt and/or restored to original Hammond specifications, or better. In many instances, components are upgraded utilizing the latest technology in parts and procedures to help prevent that component from the malfunctioning that occurs with time. In addition, Classic Hammonds® utilizes a proprietary process on the finish of all cabinetry that creates that HTP™ ultimate finish. All this while still maintaining the original Hammond integrity of the Tone Wheel organ that creates nothing short of ?The ultimate in museum and collectable Hammond organs?. The pre-amplifier is thoroughly cleaned utilizing vacuuming to remove large debris, and then blown out with compressed air. Finally proprietary blends of cleaning liquids and solvents are used to clean built-up residues. All valves are repeatedly tested for leakage, strength and consistency. When possible, only original Hammond valves are utilized, as even with their age they tend to produce better sound and readings than new valves. Newly manufactured valves rarely equal the vintage valves of yester year in tone quality or specifications. All voltages are checked with the most stringent tolerances to ensure they are within acceptable operating parameters. Due to the age of key electrolytic capacitors, they are replaced with new ones that have been engineered and built to original specifications. Although the old capacitors may pass testing, they are well beyond their designed life span and could malfunction at any time. The cable that terminates to the AC plug connector of the console is replaced. The tone generator is cleaned utilizing vacuuming to remove large debris, and then blown out with compressed air. Any rust that is found is removed and the bare metal is re-coated. Repairs to the tone generator are made, as necessary, to bring it to peak operating condition. Then every bearing and bushing is lubricated individually, to allow greater absorption deep into these parts. The drawbar assembly is opened. All drawbars contacts and contact bars are cleaned. The drawbar sliders and knobs are cleaned and polished by hand. The drawbar unit is reassembled. All keys are removed. Each key is cleaned and polished by hand. The assemblies are cleaned utilizing vacuuming to remove the large debris, and then blown out with compressed air. All rust is removed and bare metal is re-coated. The up stop and down stop felts are replaced. The key combs are checked and replaced as necessary. Keys are replaced in their original location and adjusted for front/back, left/right and top/bottom alignment. All upper and lower preset key are removed. The mechanical assembly is lubricated. All preset keys are cleaned, polished by hand, replaced in their original location and adjusted for front/back, left/right and top/bottom alignment. The upper and lower buss bars are removed, cleaned and lubed with special cleaners, then replaced in their original locations and aligned. The Vibrato Scanner is removed and disassembled. All parts are cleaned with special cleaners. Key parts are coated to prevent oil absorption, which can cause short circuiting. The scanner is then re-assembled. The Vibrato controls box is disassembled. The Vibrato knob is checked for smooth mechanical operation, cleaned, lubricated and the knob alignment is checked and adjusted for precise pointing. The switches are checked for proper mechanical operation, corrected as necessary and all contacts are cleaned. The tabs and knob are cleaned and polished by hand. The Vibrato controls are re-assembled. All lettering is re-touched by hand. The Percussion switch box is disassembled. The switches are checked for proper mechanical operation, corrected as necessary and the contacts are cleaned. The tabs are cleaned and polished by hand. The Percussion controls are reassembled. All lettering is re-touched by hand. The Pedal Board buss bars are removed, cleaned and lubed with special cleaners, replaced in their original locations and aligned. The pedal actuator assembly is removed. The assembly is cleaned by vacuuming and compressed air. All rust is removed and bare metal is re-coated. The buss bars are removed, cleaned with 2 special cleaners, replaced in their original locations and aligned. The pedal actuator felts are checked and replaced as necessary. All the Pedal Board felts are examined for proper operation, and replaced as necessary. The pedal actuators are examined and replaced as necessary. The tension is adjusted for each pedal. The brass fall board hinges and key lock parts are cleaned, hand polished and coated for preservation. All pieces containing lettering and/or numerals are cleaned and brightened to their original state utilizing proprietary Classic Hammonds® techniques and procedures. All lettering is re-touched by hand. One of two methods is performed on each of the cabinetry pieces. 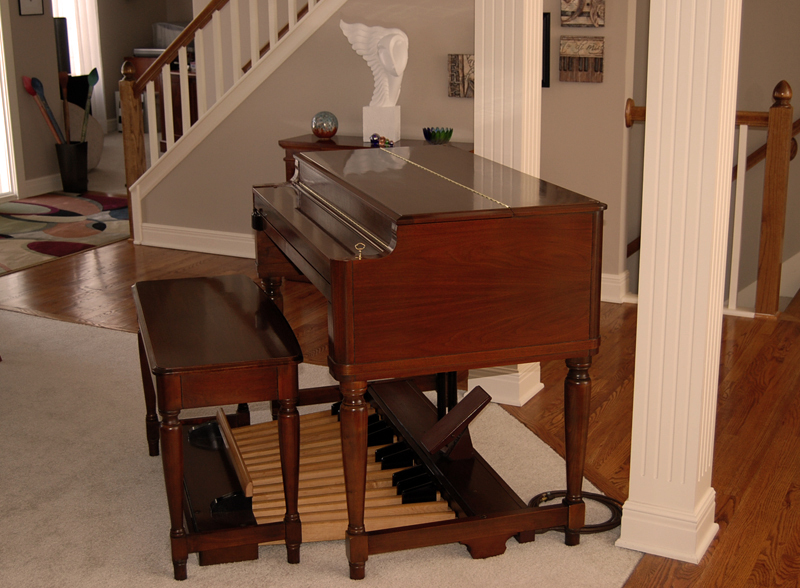 The console, bench and pedal board are revitalized utilizing some very special and somewhat rare procedures, used by highly skilled furniture finish craftsman from the Hammond period. This process rejuvenates the finish to its condition at birth. Then a Classic Hammonds® proprietary procedure is utilized to complete the process, creating the HTP™ ultimate finish. This proprietary procedure produces a rich, sleek finish with unmatched depth and shine. The console and its associated parts, bench and pedal board parts are stripped. All defects in the wood are corrected, then machine and hand sanded with 3 different grits to prepare them for the finishing process. Then a Classic Hammonds® proprietary finishing procedure is utilized to complete the process, creating the HTP™ ultimate finish. This proprietary procedure produces a rich, sleek finish with unmatched depth and shine. The amplifier is thoroughly cleaned utilizing vacuuming to remove large debris, and then blown out with compressed air. Finally proprietary cleaning liquids and solvents are used to clean built-up residues. All valves are repeatedly tested for leakage, strength and consistency. When possible, only original Leslie valves are utilized, as even with their age they tend to produce better sound and readings than new valves. Newly manufactured valves rarely equal the vintage valves of yester year in tone quality or specifications. All voltages are checked with the most stringent tolerances to ensure they are within acceptable operating parameters. Due to the age of key electrolytic capacitors, they are replaced with new ones that have been engineered and built to original specifications. Although these capacitors may pass testing, they are well beyond their designed life span and could malfunction at any time. The horns are inspected for defects and cracks. If necessary, it is replaced with a vintage Leslie Bakelite horn. The high frequency driver is connected to a sound generator and rigorously tested throughout a specific sound spectrum for distortion, rattling, humming, buzzing and other defects. If necessary, it is replaced with a vintage Jenson v-21 high frequency driver that has passed the strenuous testing. The lower rotor drum assembly, bearings, rubber bushings and scrim cloth are replaced with engineered-specific reproduction parts. The woofer is inspected for defects and flaws. It is also connected to a sound generator and rigorously checked for proper tone throughout its spectrum. It is either reconed or if necessary, replaced with a vintage Jensen p15L or c15L woofer that has passed the strenuous testing. All four upper and lower motors are disassembled, cleaned, and lubricated. All springs, bearings, rubber bushings, drive belts and idler pulley bearing are replaced with new engineered-specific reproduction parts. 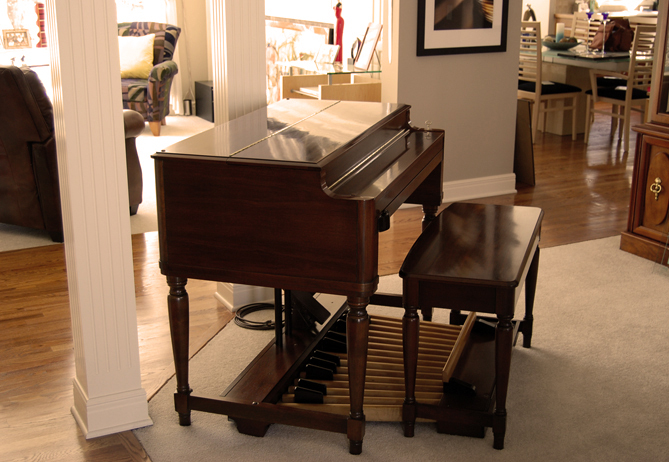 The same methods and processes are utilized on the Leslie cabinet as used on the Hammond cabinetry. Meticulously, the reborn tone generator, keyboards, drawbar assembly, pedal assembly and pre-amplifier are re-installed. All wiring is soldered, connected and dressed. The completed Hammond is now ready for a test drive. Attentively, the high frequency driver, horns, woofer, rotor and motors are re-installed in the Leslie. Belts are adjusted for exact tension to produce proper speed up and slow down. The Leslie is now ready for mating to the Hammond for a test drive. Numerous quality control checks are performed continually throughout the reassembly process on the Hammond and Leslie to ensure they meet the necessary standards to wear the Classic Hammonds® badge.